A first of its kind study, led by Dr. Claire Horwell of the Institute of Hazard, Risk and Resilience at Durham University, UK, has measured the effectiveness of different types of respiratory protection against volcanic ash. 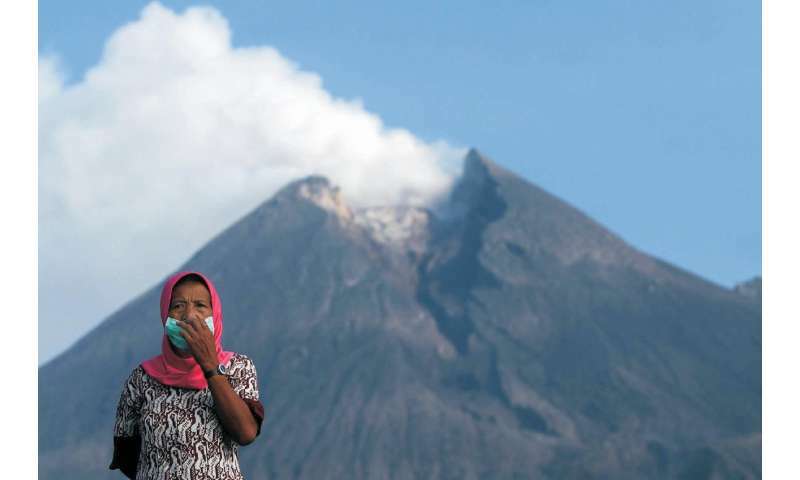 In recent months, erupting volcanoes have affected Hawaii, Guatemala and Bali. Volcanic ash can induce symptoms such as coughing, breathlessness and wheezing as well as exacerbate pre-existing conditions such as asthma and bronchitis. Recommendations from this project were applied in Bali and Hawaii, where local Non-Governmental Organisations and governmental agencies distributed N95 masks based on the project findings. The team hopes that their findings will also inform responses to future volcanic eruptions. The research, carried out in partnership with the Institute of Occupational Medicine (IOM), Edinburgh, tested a range of respiratory protection frequently used by communities affected by volcanic ash, including bandanas, surgical masks and more sophisticated industry-certified 'N95' masks. Dr. Horwell said: "Surgical masks are a commonly distributed form of respiratory protection and our study raises important questions around this, and the need for agencies to provide information regarding their effectiveness. "Our study provides recommendations based on solid evidence, which are now informing aid agencies, health departments, and individuals about the most effective forms of protection against volcanic ash. These recommendations are also helping communities avoid developing a false sense of security from wearing protection that may not be as effective as they think." The team have used the results of their study to develop recommended actions which are now available on the website of the International Volcanic Health Hazard Network, the umbrella organisation for research and public dissemination on volcano health issues, which is run by Dr. Horwell. The research study was designed to understand how both the filtration efficiency (FE) of mask materials, and the facial fit of a mask, could impact on the effectiveness of protection, as well as how users perceived the different types of protection they were testing. In the study, the FE of 17 commonly used forms of respiratory protection was tested using samples of volcanic ash taken from eruption sites. 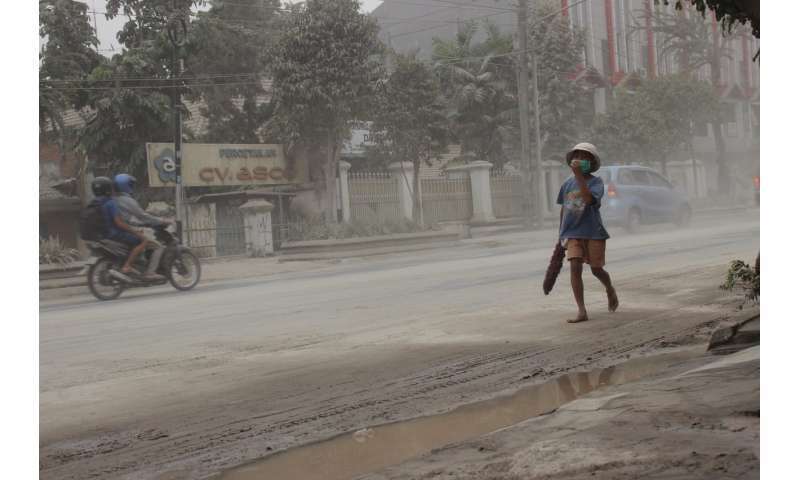 The industry-certified masks, a mask marketed as being effective at blocking fine particles known as PM2.5, and a very basic mask from Indonesia achieved FE approaching 100 per cent. Surgical masks had FEs of around 90 percent. In contrast, cloth protection such as bandanas, offered a poor FE at less than 44 per cent. Wetting materials did not help improve their performance, although folding the material did help a little. The researchers went on to measure the Total Inward Leakage (TIL) of four types of protection with the best filtration efficiency results, to understand how facial fit affected effectiveness. Volunteers wore each type of respiratory protection during a simulation of volcanic ash clean-up activities, whilst the research team measured TIL. Whilst the industry-certified N95 masks achieve a TIL of less than 10 per cent, surgical masks, which are commonly distributed during volcanic ashfall, had a TIL of 35 per cent due to their poor facial fit. The TIL of surgical masks improved to 24 per cent by tying a bandage over the top, but this affected perceptions of comfort and breathability for the wearer. Dr. Karen Galea, IOM, explained: "When respiratory protection is distributed to communities affected by volcanic ash, there is not necessarily any advice or training given on how to achieve the best facial fit. "Overall, the industry-certified N95 masks performed best. However, these masks are not without their challenges. Not only do they tend to cost more than commonly distributed surgical masks but, also, they are often bulkier, giving rise to logistical challenges around storage. "Our volunteers did observe the industry-certified masks as being uncomfortable to wear but perceived this mask as providing the most protection due to sturdiness and fit." The study, published in two papers in the International Journal of Hygiene and Environmental Health, is part of the Health Interventions in Volcanic Eruptions (HIVE) project, funded by ELRAH's Research for Health in Humanitarian Crises Programme which aims to improve health outcomes by strengthening the evidence base for public health interventions in humanitarian crises. Cloth masks—dangerous to your health? Students too cool for surgical masks?